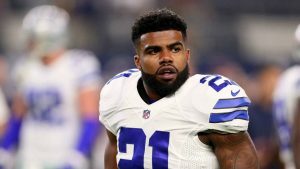 5 Questions For Week 10: What Do Ezekiel Elliott Owners Do Now? Lots of questions linger for the second half of the football season due to injuries and other issues. Each week I try to tackle some pertinent subjects and as such, I bring you 5 questions for week 10. Feel free to hit me up on Twitter (@brendancole16) if there are any specific questions that you would like me to address in the future. A six game absence can be expected for the Cowboys' star running back. Zeke Elliott is set to start serving his suspension in week 10. 1. It looks like Ezekiel Elliott is officially suspended. Which Cowboys players should be picked up/started in his place? Week 10 will mark the beginning of Ezekiel Elliott's six game suspension. So what are fantasy owners to do? This is a tough one as the Cowboys offensive line is not the user-elite unit that it has been. Backup running backs Darren McFadden and Alfred Morris are very similar as far as potential and past accomplishments. A major difference, for the moment, is that Alfred Morris has been tabbed the starter at the moment. That is going to change if he does not hit the ground running, but Morris is the man to start right away. The highest ceiling probably belongs to backup Rod Smith though. He runs hard, has something to prove and is working with fresh legs. Youth is especially important at running back. Most players tend to get ground down in just a couple of seasons due to the beating they take. To recap, my answer is start Morris if you need someone for week 10. If you are looking for playoff help, however, grab and stash Rod Smith. 2. What are the prospects for the Texans offense moving forward? The downgrade represented by Tom Savage has been undersold. Elite talent will shine through, but mid level players are going to fade. Lamar Miller should continue to be a borderline RB1/RB2. He has averaged 4.5 yards per carry with Tom Savage in the game, so there is not a big drop-off. His receiving stats will likely not be as impressive though. DeAndre Hopkins should put up WR2 numbers for the remainder of the season based on sheer volume. Will Fuller, on the other hand, is going to be borderline invisible. Fuller's utility as a deep threat meshed perfectly with the ability of Deshaun Watson to extend plays. Tom Savage does not have that skill set and as such Fuller is borderline un-startable. Beyond Miller and Hopkins, the Texans will not offer much to fantasy owners for the rest of 2017. 3. Which Wide Receivers Will Go Huge In Week 10? 4. I Need A Last Minute Fill-In, Who Should I Pick Up? QB - Case Keenum MIN Among all quarterbacks, Keenum is 8th in vertical pass attempts. The Redskins defense is 21st in fantasy points allowed to opposing QBs. Dial him up if you're in a bind. RB - Devontae Booker DEN He has been the most effective back for Denver and his snaps are increasing. Add in a plus matchup and dinged up C.J. Anderson and you have a recipe for success. Bonus WR Dice Roll Tre McBride III CHI It is an incredibly small sample size, but McBride had a nice rapport with Trubisky last week. He came close to 100 yards against a Saints D that has been slaying the opposition. With a tough bye week, he may be a worthy gamble. TE - Eric Ebron DET Hope springs eternal for the once and future sleeper. Ebron has always had the potential, but never the results. Even he cannot go wrong against the Browns; start him in week 10. 5. What Is The Most Interesting Game Of The Week For Fantasy Players? In week 10 there are some exciting games scheduled, but I would have to say Dallas at Atlanta gets the gold star. This will be a real litmus test for the Cowboys offense minus Zeke Elliott and facing a good defense. Meanwhile, Atlanta is still sputtering on offense after an epic 2016 season. There is a playoff feel to this game and it may provide some important insights on the rest of the season. If you missed any FK articles this week, go back and check out what the buzz is about. There is still time to get valuable advice before the weekend games kick off. Be sure to come back often as we update often with exclusive content. For some extras, follow @_knuckleheads on Twitter.